Planning a St. Patrick’s Day party? You’re in luck. 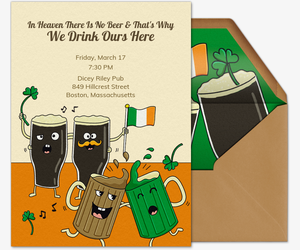 Evite’s St. Patrick’s Day invitation gallery features dozens of free and Premium hand-crafted digital invitations. 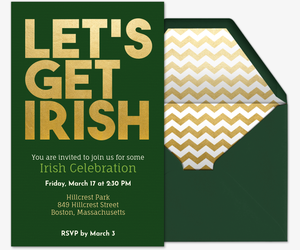 Whether you’re gathering friends and family to commemorate the patron saint of Ireland and celebrate the Irish culture or just love any reason to throw a boozy bash, Evite is here to help start the festivities. Provide all the party details in a custom message to your guests. Let them know whether they are welcome to bring along friends -- or whether they need to be decked out in green or put up with pinching. Hosting a get-together just for grown-ups? After you create your online invite, encourage guests to BYOB using our What to Bring list. Throwing a kid-friendly classroom event for little leprechauns? Let parents know if they can contribute snacks or favors. Then head over to Evite Party Ideas to get tips from the experts. 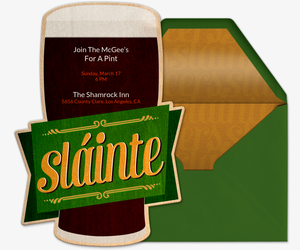 No need to dip into your pot of gold -- keep it simple with a free e-invite. 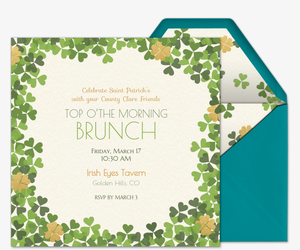 Our St. Patrick’s Day invitation gallery features dozens of festive designs for all kinds of celebrations. 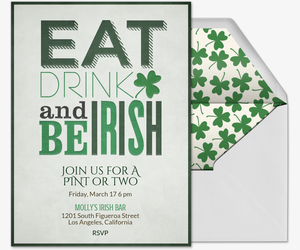 Send out our alcohol-themed invitations if you’re heading out to pubs and festivals for green beer and mischief, or send out friendship-themed invitations if you’re inviting friends over to watch the parade on television and get together for an Irish-themed meal. You can also choose one of our clover-decorated designs, or one featuring an Irish proverb. Or personalize your pick by uploading a favorite photo onto one of our upload-your-own invitation templates. Send a Premium Evite invitation for less than the cost of a postage stamp. Our advertisement-free Premium Evite invitations come with coordinating envelopes with festive liners and stamps; pricing is based on the number of guests. Looking to DIY? Customize our upload-your-own or design-your-own invitations with personal pics. Once you’ve sent out your lucky invitation, head over to St. Patrick's Day Party Ideas to get top tips on hosting a St. Paddy’s party. If you’re grabbing drinks with friends, make it an all-night adventure with our free St. Patrick’s Day Pub Crawl printable, which includes a bar schedule and handy contact tag for any friends who get lost along the way. If you’re hosting at home, follow our recipe for whipping up a Bailey’s-spiked clover shake or baking magically delicious lucky cupcakes. No matter where you’re entertaining, gift your guests with party favors decorated with our “You Sham Rock” printable tags. Evite Party Ideas is also the place to get etiquette tips for hosts and guests. Party got out of hand? Check out our tips for dealing with a drunk party guest. Unsure how the party will go? Get our advice on how to nix pre-party nerves. Cheers!